Have you ever found yourself waiting out a rain storm with nothing pressing to do? With time on your hands, you may start playing in the puddles left by the deluge, dipping the toe of your shoe into the water and drawing simple designs on the dry part of the sidewalk. 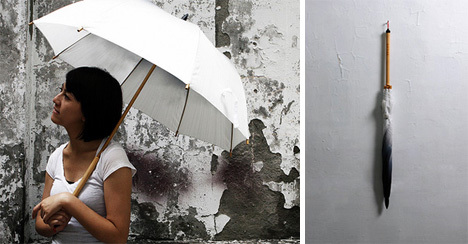 This impromptu, impermanent graffiti was the inspiration behind the delightful Rain Brush Umbrella design from Liu Hsiang-Ling. This simple design takes an item that most of us carry on a rainy day (if we are well-prepared, anyway) and adds a writing brush-like tip to turn it into a fun toy. 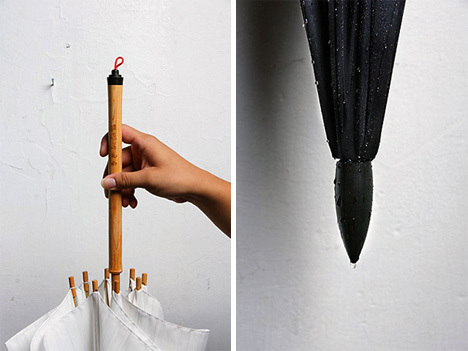 The umbrella can be used to draw or write with the rainwater that collects all around on a stormy day. Simply dip the silicon tip into a puddle and use the water to leave a positive message on a receptive surface while you wait for a bus or engage in some people-watching. The idea of using a rainy day to create unexpected art is a wonderfully creative one. 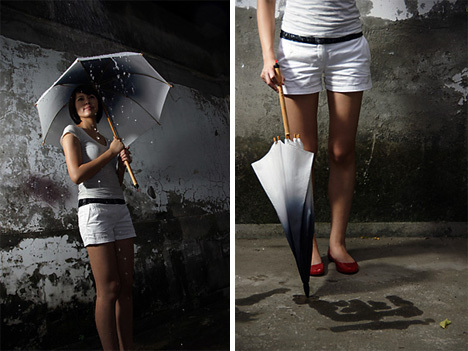 Refusing to give in to the common perception of rainy days as depressing, commuters and playful people could certainly brighten up the days of those around them by playing in the rain with this fun umbrella.